DHSE HSCAP announced Kerala Plus One (+1) Second Allotment Result 2018 on 18/6/2018. All students can check the Plus One 2nd Allotment Result from HSCAP website www.hscap.kerala.gov.in. If the candidate has got the allotment, they should take the admission on June 19th and 20th. 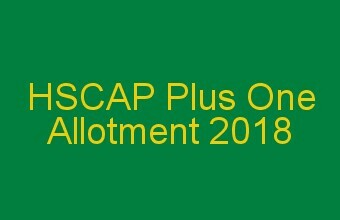 DHSE Plus one second allotment 2018 is the final allotment in the HSCAP main allotment. All he students who got the allotment in the second allotment 2018 should report to the alloted higher secondary school within the scheduled admission date with fee and allotment letter and take permanent admission. Those who fail to do this, they will lose that allotment and will not be considered for any further allotments. Plus one 2nd allotment admission for the allotted students on 19/6/2018 to 20/6/2018. 3. To Check the allotment result, Enter your application number and date of birth. 5. Take print out of allotment letter. After the first and second allotment DHSE will conduct a HSCAP Plus One supplementary allotment for the vacant seats. The candidates who are not included in the first and second allotment, they will be considered for supplementary allotment. For considering supplementary allotment, they should renew their application. According to current seat vacancies they could change their options. If candidates not renewing their application, they will not considered for supplementary allotment.